Kids with autism got to splash around and catch some waves. 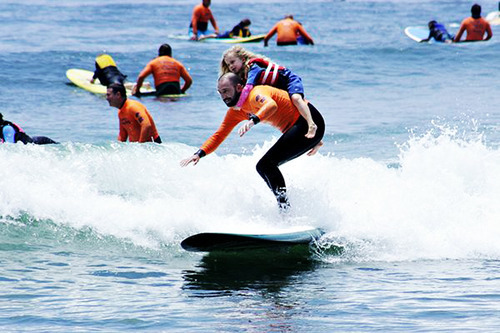 The children were participating in the 6th annual Surfers Healing Camp, an event that pairs children with autism and professional surfers for a day of fun at the beach. Pro surfer Izzy Paskowitz, founder of Surfers Healing Camp, has a son with autism named Isaiah. He found that the beach and being out on the water had positive and calming effects on his son, and he wanted to share the experience with other children who have autism spectrum disorders. Now, Surfers Healing Camps happen throughout the year at different surf spots in the U.S.
“I always wanted my son to be included to his best capacity,” Paskowitz told ESPN. “There were so many things that he couldn’t do. It’s mostly the ocean and being in the water and feeling the waves and the sensation and the sensory aspect of the ocean. Previous Post: Respect. Women. Full Stop.